It's always a great day when a new piece of Ashley Anderson's artwork appears on Flickr. The latest example of this Atlanta-based artist's talent is called "Memory Beach 02," and it will soon grace on the walls of a local yogurt shop. "The girl's face is from Ao no Senritsu for the Famicom. 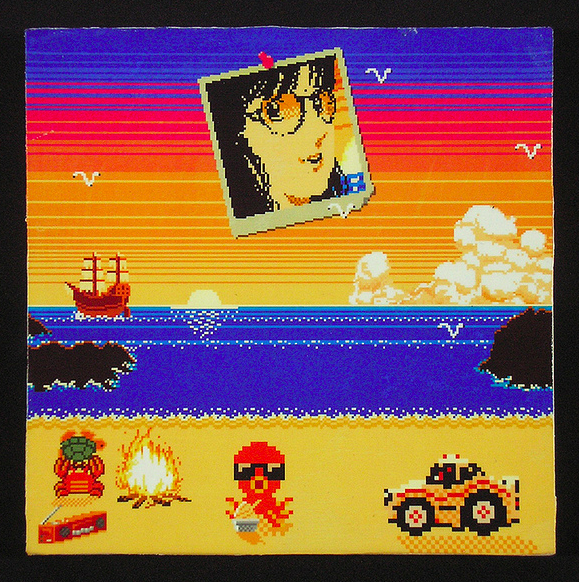 The polaroid border on the photo of the girl is partly drawn by me and partly borrowed from SimCity for the SNES. The thumbtack is from scratch. The ocean, beach, sunset, and ship are from the end screen for Goonies for the NES. The octopus is from Adventure Island for the NES. The seagulls are from Family Composer for the Famicom. The crab holding the turtle is from Kame no Ongaeshi - Urashima Densetsu for, I think, the Famicom. The stereo is from Guile's stage in Street Fighter II. The car is from Famicom Grand Prix II - 3D Hot Rally for the Famicom. The bonfire is from Kazekiri for the PC Engine." Go here for more information about "Memory Beach 02." To see more of Anderson's portfolio, go here. It's so nice to be able to have a breakdown of all these elements that look so familiar! Sweet piece of art! Perfect for a yogurt shop. Justin: Yeah, every time Ashley posts a new piece on his Flickr photostream I can't help but wonder which games served as inspiration. So, this time I asked! Anyway, mark my words: Someday I will own one or more pieces of Ashley's artwork! It is a nice breakdown indeed. I was having trouble identifying them just by looking at 'em. Makes me want to finish Goonies just to see that end screen! You should totally get some of this guy's stuff! Glad to hear you like the image, too, Sean! Oh, and I'll definitely pick up some of Ashley's stuff at some point -- esp. if he makes a few more Bubble Bobble-inspired pieces.